Whether you’re looking for places to run, walk or picnic or you’re just keen to enjoy what mother nature has to offer, this list is for you! Singapore has beautiful parks and reservoirs that are open to the public for you to enjoy with friends and family. Yes we know it’s hot… but once you’re out there you’ll forget about it! This is one of several new green zones that have been planned around the various reservoirs that occupy the centre of the island. The park complements the recently launched Springleaf and Chestnut Nature Parks. Covering 75 hectares, Windsor features three new hiking trails (Drongo, Squirrel and Hanguana) and a 150-metre sub-canopy walkway. An impressive oasis of greenery, with terrain varying from rolling lawns to jungle, and plant life from orchids to cacti. In 2015, it was inscribed as a UNESCO World Heritage Site, the first and only tropical botanic garden on the list. It features the Jacob Ballas Children’s Garden, a special garden for kids, while Symphony Lake is a great spot for families and friends to gather for picnics and open-air concerts. For information on events, workshops and tours, visit sbg.org.sg. This recreational and educational park that includes a variety of show gardens to inspire people who love gardening. The nursery sells plants and garden accessories. Meander along the lakeside boardwalks of MacRitchie Reservoir, or hike through the forest on a cross-country trail. Routes vary from one to five hours. A highlight is the HSBC TreeTop Walk – a 250-metre aerial suspension bridge with panoramic views over the surrounding rainforest and Upper Peirce Reservoir. Even in the heat of the day, the jungle keeps it cooler. The reservoir is home to just one of Singapore’s many popular running trails. Attractions here include World War II bunkers, tunnels and a fort. The park also boasts panoramic sea views and is great for picnics. One of the largest swathes of primary forest left in Singapore, it’s home to more than 840 flowering plants and over 500 animal species. The park also boasts Singapore’s highest peak and several winding forest trails. Recent rehabilitation works saw some areas close to the public for a period of time; check nparks.gov.sg for updates. 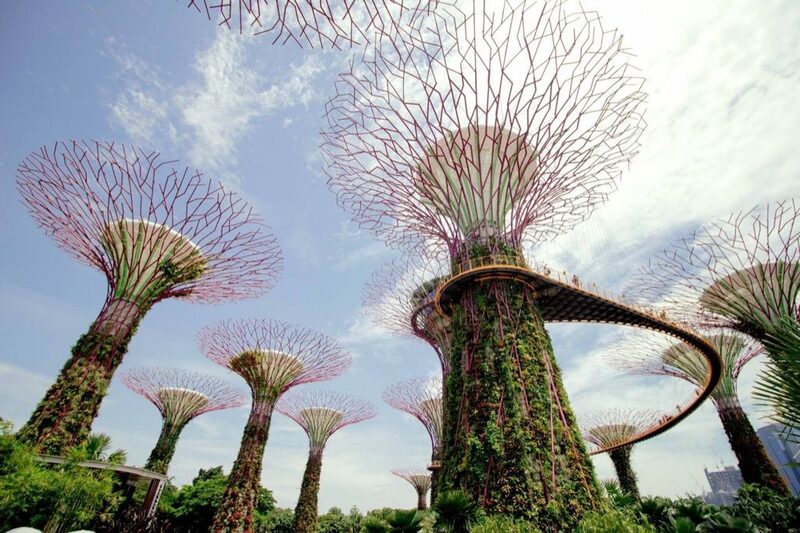 Singapore’s largest and most popular park offers a long stretch of sea, sand and swaying palms. Come here for the breeze and enjoy walking, cycling, rollerblading and barbecues. The well-loved Marine Cove also finally reopened in July 2016 after a four-year hiatus. It features a huge outdoor playground as well as a variety of family-friendly dining concepts including a unique upscale Macdonald’s outlet. Editors’ tip: Exercise aside, the outdoor restaurants and hawker centres here are a great place to watch the sunset. This walk provides some wonderful panoramic views over the city, the harbour and the southern islands. You can also take a cable car to Sentosa from here. This links a series of a hill trails between Mount Faber, Telok Blangah Hill and Kent Ridge Park, with great views across the Telok Blangah area. Highlights are the undulating Henderson Waves Bridge and the elevated 1.3 kilometres of Forest Walk. This is another new green space for Singapore. Located between Old Upper Thomson Road and Upper Thomson Road, the park’s trails will take in heritage highlights including a former Hainan village. Spanning 101 hectares it comprises three waterfront gardens, the towering supertrees and two massive indoor environments: Flower Dome and Cloud Forest. The showcase of horticulture and garden artistry aims to “bring the world of plants to Singapore and present Singapore to the world”. And the Children’s Garden (free entry) is a treat, with water-play areas, swings, climbing equipment and an adventure trail. You’d never guess it but it’s built entirely on reclaimed land. Attractions include a bird sanctuary with boardwalks, sea views and an adventure playground. On Singapore’s northeast coast, 71-hectare Pasir Ris Park (close to Changi Airport) is popular for pond-fishing and bike rental and has a six-hectare mangrove forest with boardwalks. Established in 1859 as an arms store, barracks and hospital, Fort Canning is sprinkled with memorials of Singapore’s history. Attractions include Sir Stamford Raffles’ personal bungalow and the Spice Garden – a replica of the original 19-hectare tract established by Raffles in 1822. There are plenty of winding paths and quiet spaces too. One of the oldest coastal parks in Singapore, Changi Beach Park offers over three kilometres of coastal boardwalks passing long stretches of beach. Wind your way through the mangrove forest boardwalks, or watch the birdlife over the freshwater wetlands – especially during the September to March migratory season. Check sbwr.org.sg for regular workshops and demonstrations. Opened to the public in October 2015, this ecologically sustainable park focuses on conserving energy and water, recycling and retaining the natural elements in the park. Try your hand at bird watching and look out for one of the 80 species of birds. Explore its rich biodiversity in the variety of habitats, including coastal forests, grasslands and mangroves. Visit for an interesting mix of planting, landscaping and oriental architecture. Attractions include a main building based on Beijing’s Summer Palace and an extensive bonsai garden. Lanterns light up at night during the mid-autumn festival. Crossing the water to this island is like taking a trip back in time. Get a taste of what Singapore was like in the 1960s by exploring the island’s trails, shady rubber plantations, isolated beaches and thriving mangroves. Hire a bike and check out the Chek Jawa wetlands. You will get to see mangroves, coastal forests, seagrass lagoons and coral rubble. To get to Pulau Ubin, take a bumboat ($3) from the Changi Point Ferry Terminal. Due to open in 2020, it will cover 67 hectares at the southern end of the Bukit Timah Nature Reserve. Among the plans for the park are hiking trails with various degrees of difficulty and a sky garden with an elevated walkway. Don’t miss our great online roundup of all the canine-friendly green spaces in Singapore or see our pets guide here.